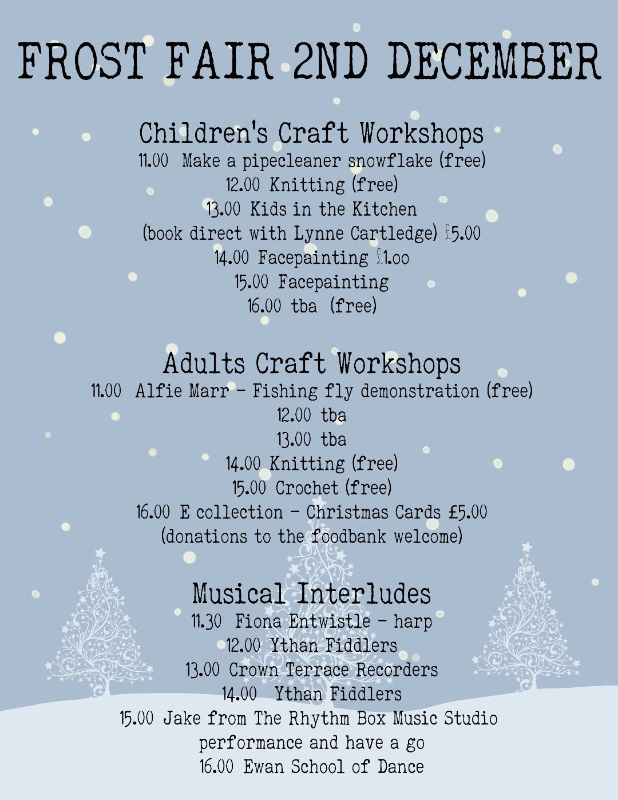 Here’s the latest news on the happenings at the Frost Fair, Udny Green Hall on Saturday. Take a look at the children’s programme and you will see there are lots of things to keep those little hands busy. For the adults we have an exciting new demonstration on how to make a fishing fly as well as the return of some popular favourites and a card making class with Emma. Please contact e.hare0612@googlemail.com to book space. Most of the classes are free but donations to the food bank are welcome. We have a full programme of musical interludes, returning are some of the popular performances from last year and we also have an exciting new drumming session after which adults and children will be invited to have-a-go and we finish the day with some of the dancers from the Ewan School of Dance.